When strolling through the grocery store, I always see this bottle of wine, but for some reason I've never really given it more than a second glance. Maybe it's the odd label, that to me, actually makes me think it's going to be utter crap. The label is bold and stands out, but it's not classy in any way and shares nothing that speaks to me as being a tasty wine. But, of course now you're saying that you shouldn't judge a book by its cover, yadda yadda, I understand this. And maybe I'm becoming a bit pretentious in my boozy mindset, although I rarely drink any wine over $30 a bottle. So finally, I put my initial reactions aside and picked up a bottle. Anyway, this wine pours a dark, dark garnet and is fairly viscious, with surprisingly good legs on the side of the glass. It has aromas of blackberries and plums, that carry over into the taste with more blackberry, dark cherry, dry plums, a touch of pepper and oak, and moderate tannins. The flavors are a little strong and raw, perhaps too straight-forward, but honestly this is pretty much a stereotypical good (not great) Cabernet Sauvignon. 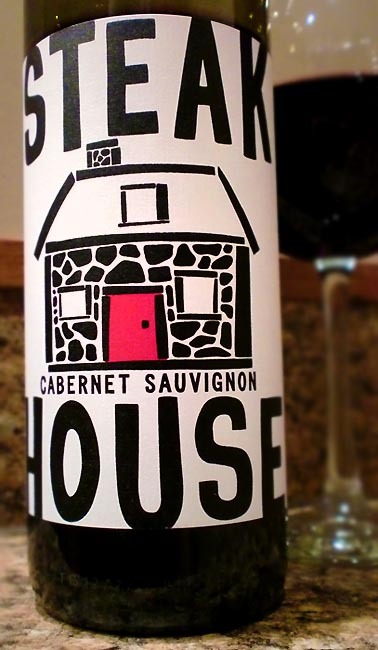 Nothing is striking or remarkable here, but it's a good Cab, especially at the $9-10 price point. Better than I was expecting. I'd drink this with a fat, juicy grilled ribeye most definitely. I actually loved this wine! I was looking for a Malbec my absolute favorite wine...they were too expensive for my taste and the man in the store told me to try this one. While I am far from a wine expert I have a strong palate. I just absolutely loved this! It is Malbec like which I love and has a bold smooth just yum to it. It is going down as one of my favorites! Yeah, it's really not too bad, especially for the price!